Falling Through The Lens: Toyed With opens Friday! 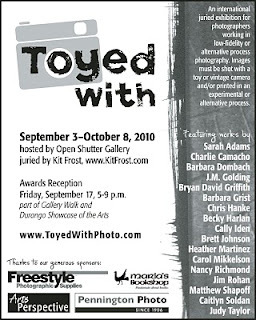 The Toyed With exhibition, which includes two of my photos, opens this Friday, September 3, at the Open Shutter Gallery in Durango, Colorado. It's going to be a wonderful show - you can preview the images here (hold your cursor over "Gallery" and click "Accepted Entries"). If you're in the area, I highly recommend it!